Re: new toy? should I do it? A Honda what? They make all kinds of toys. I saw over on the other forum that someone gave him an Interceptor. I had a project VFR700 many years ago that I bought wrecked and rebuilt. 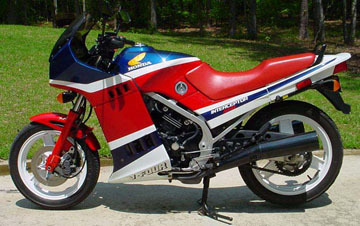 I also had a VFR500 back before my son was born 32 years ago. That bike was a hoot! I love a good rescue! So what all is wrong with it? Does it run? What are your plans with it, oem restoration or custom build? Grat's Rich, enjoy, WW ebay will be your friend in sourcing those older parts. kinda an "apocolypse/zombie killer thing..."
that's a bike deserving of restoration. Mad Max style could be a fun build indeed, would solve a lot of parts shortage issues, it's your canvas MOB! When people post notes (like above) that this little information on them,,, it drives you crazy. I surf craigslist too much for sure. You just don't see many nice early model interceptors that haven't been molested by some kid somewhere. It's all there. Keep it stock perty please? X2. I hate ugly builds of classics. How far are you gonna go with this? From the looks of it... until it's perfect. must control my emotions... but man, I can't wait to hear this scream at 12.5k rpm... yeah, that's what they do...and why they were so desired.. damned techno marvel for an '86. MY 83 V45 is still the one you regret selling many years later. I never rode the 500 although my buddy had one. He loved it's nimble handling. I still love those Honda V fours. What a great project bike. I don't remember factory lowers on the early Interceptors. I'm pretty sure the original years didn't have them. I will follow this rebuild with great interest(if you keep us up to date). I'm happy for Rich. I hope it comes out great. If anybody can do it...my money's on you! I can't find a specific Lockhart version, but the version on the one I'm grabbin, and also the one above it in the other photo, is from Airtech, and was of Euro manufacture, most commonly used on the Vf500f2 models for full aero effects.. vs the bottom 'cowl', which came from the factory. should have "live photos' on Thursday... in my garage. Well if you don’t like it, I’ll give you your money back on it. Now...there's a deal that's tough to beat! Weren't these Honda V4 engines famous for the cams grinding their way down through the head castings? I'd hate for that to be the case with this one. I heard Honda did lots of warranty replacement in the early days of these engines so perhaps this one is new enough or Honda already dealt with it. Hope ya have small fingers as they are very tightly packed. A friend had the VF400 and it was a PITA to work on. No, the VFs and smaller VFRs are notorious for crap camchain tensioners. Its why Honda went with gear driven cams for the bigger VFRs.